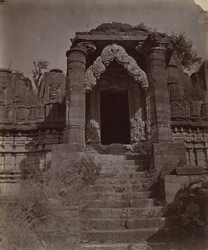 Photograph of the entrance to a ruined Jain temple at Eklingji, taken by O.S. Baudesson in 1882. Eklingji is situated in the Rajsamand district of Rajasthan. The town is best known for a large Hindu sanctuary built close to a small lake.Within this compound there is a Hindu temple enshrining an image of the guardian deity of the rulers of Udaipur built in the 15th century. The Lakulisha Temple of 972 is situated in the same compound and some other minor temples, like the temple in this photograph are situated around the compound. The identity of the building is uncertain: Bloch notes that the print book in the Indian Museum, Calcutta lists this as the front view of a ''Jain temple, called Sati dewal'', at Chittaurgarh. The caption above is taken from the negative, and is presumably more accurate.